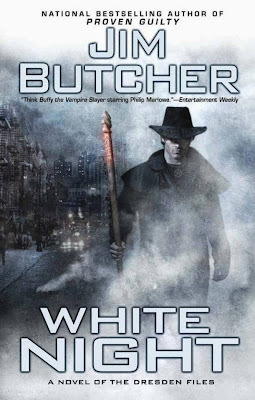 We continue our readthrough of Jim Butcher's uber-popular urban fantasy series The Dresden Files today with book nine, White Night. The continuing plan is to do a book a month on the first Tuesday of each month, and with 16 books on the publication schedule between now and when our readthrough is over, our reading list should be pretty full for the foreseeable future. We're now officially past the publication halfway point, and while I'm not sure whether this was my favorite entry in the series so far, it has given me a much broader appreciation for what Jim Butcher is accomplishing. First and foremost, I appreciate that Butcher, time and time again, wastes no time jumping into the overall plot. Within the first few pages, we're right in the thick of it with some good action and a quick reminder as to where we're at. Yes, White Night like the book before it is absolutely another supernatural murder mystery (now with more serial killing), but we are getting somewhere with this in part as a result of the prior books as opposed to what felt like a diversion in the previous entry. We get a lot of the old faves, from Harry's brother to a healthy helping of Murphy, and some of the most compelling scenes, for me, were with Harry's new ward, Molly. Both an annoying young girl and a precocious individual, she brought a lot of extras to the story both from a plot standpoint and as a way to fill in gaps in the story and setting organically as opposed to how the traditional stories went about it with Harry's random asides. Also great? Butcher knows how to write the last quarter of a book. Without giving anything away, the final act of this book felt a lot bigger, broader, and badder than anything that's come before it, and while we've been conditioned at this point to know that Harry will somehow pull it off, that sense of danger has simply been transferred to his friends and collaborators now. It's a deft change of pace. There really hasn't been a bad book in the series yet, but I really feel like the story is hitting its stride in a significant way. We've got a broad cast of characters that are being used for specific reasons, being introduced as meaningful and then having roles to play in harm's way, and there's no feeling of dangling plotlines or missing information as things come in and out of Dresden's world fairly regularly. There are a few things from the early books that I'm waiting on a payoff for, and I don't doubt I'll get them. That's good writing. Is the series along the lines of more epic fare? Of course not, but it also (and perhaps most importantly) isn't trying to be. It's a great sale with a lot behind it. A fun note: if you're looking to five into the series, Dead Beat, the first novel, is under $3 for Kindle right now. Worth checking out! It is rare that by book 8 in a series it keeps its momentum and freshness but these just get better and better and this one is my favourite. He becomes a little darker and mean in this book, but his humour improves too.